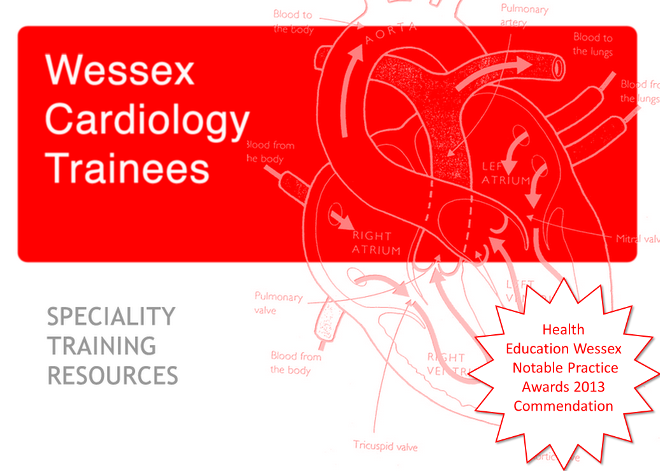 Also I have been given details of what looks like an excellent two day course covering ACHD - it is on the 16 & 17th October at the BCS in London - click here for more information. Dr Critoph has highlighted this interesting course on advanced imaging in interventional cardiology. It sounds like it will be a helpful course covering the key relationship between these ares, there are opportunities for 'hands on' experience and its free! Click here for more details. Also we haven't had much of a response to the Poole training day sign up as yet (the team at Poole and Bournemouth have put in a lot of effort to arrange what sounds like it will be an excellent day combining imaging and heart failure) - there are still more than six weeks to go so you should still have time to give your trusts notice to come - click here for more details and email me to sign up jwh20485@gmail.com. Thank you to everyone who has completed the training survey! The Poole training is now just under two months away - still plenty of time to get your study leave request in time for 6 weeks notice! The Poole and Bournemouth Consultants are arranging what will no doubt be an excellent program on heart failure and imaging. This will be held on the 10th of October in the Postgraduate Centre at Poole Hospital. Further details to follow but please let you team know so that you can get the time protected and also contact me to sign up jwh20485@gmail.com. Also the National Training day is six weeks away, it is always an excellent day - you can see more and should be able to sign up soon via this link. Thanks to all those who have already completed the survey, this really does help to guide any changes that are needed to improve training. There a couple of hospitals (Poole and Dorchester) which have had no responses as of yet. Please do try to complete the survey - it will only take 5 mins or so and your answers will be kept anonymous (if you are from a trust with only a small number of trainees we will group answers from these trusts in order to ensure your anonymity). Tim from BMS is kindly going to sponsor the next evening event which will be on the 27th of September at the Wykeham Arms in Winchester. The title for the evening is ' what I wish I'd known when I started training' and will cover topics including how to get your BSE accreditation, how to go out of program and other trainee issues. Whilst this is targeted at those in the earlier years of training, everyone is welcome and it would of course would be helpful to have other more senior trainees to pass on any pearls of wisdom! Plus the Wykeham arms is always a great venue! As always the numbers are limited so please email me to sign up as soon as possible jwh20485@gmail.com. Further details regarding timings will follow soon! Certification in radiation protection is a mandatory requirement for all of you. This is assessed at your ARCP and it is strongly recommended that you complete this training early on (ideally ST3), so as to achieve maximal benefit throughout your subsequent time in the cardiac catheter labs. Traditionally this has meant attending an Ionising Radiation Medical Exposure Regulations (IRMER) course, something which I am sure the majority of you have already done. For those of you who do not an IRMER certificate, especially those who are just beginning your training, there is now an online learning option which you can utilise. The course, Radiation Protection For Cardiology, can be completed from the luxury of your own home using the link provided. John Paisey has confirmed that local ARCP panels will accept this online certification as sufficient evidence of radiation protection training. Thank you to everyone who has completed the Wessex Trainee Survey so far. Unfortunately we have not received responses from a number of you. Please complete it now, it will take you less than 5 minutes and the responses are extremely useful for the STC.